I spoke to my sister for a few minutes this morning. She brought me a light bulb that she’d bought me months ago and wine corks that I’m going to do some kind of crafty thing with. We talked about being lonely vs. being alone, and I told her that I’ve finally learned the difference. I’m an extrovert but I’m happy with the quiet and the solitude. I’m happy with ruffling the scruff and scratching the ears of my dog, than spending time with people that talk to much. I’ve let go of toxic people and I’ve let go of the toxicity within myself. 2014 has royally sucked but as it draws to a close, I’m thankful for what I experienced during it. I mean, at least I’m alive to tell the tale. But now it’s time to write the final words and close this chapter. My friend Bette said in 2015 we deserve to find George Clooney’s twin and have him whisk us away to the Caribbean. He could feed us grapes while we tanned our pale bodies on the deck of his yacht. I told her I wouldn’t care if I had to draw his bathwater and wash his dishes. Hell, I’d swab the poop deck if necessary! 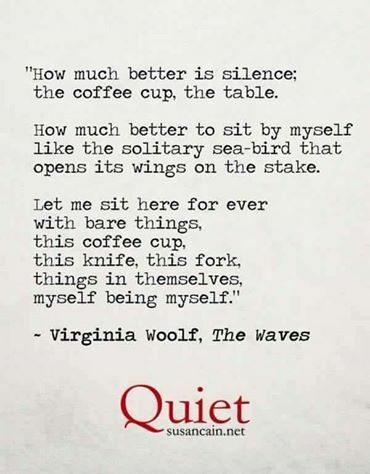 So this morning I will enjoy the coffee cup, the knife, the spoon, things in themselves, and myself in myself. Have a happy Sunday my lovelies. Absolutely. Have a great Sunday and let’s get ourselves a great year coming up. U deserve that. We will have a great year, I can just feel it. Especially if you end up coming to the states for a visit! Being an extrovert it can be a drawback, but I tell ya I’ve learned that it is a very good thing. It IS in finding ourselves and loving that person regardless of where we are at. Being happy in ourselves with other people or alone. At the moment you have been through the ringer, so to speak, and some serious time out is required to adjust to the new you. Your inner self has had a major change and it does take some getting used to, especially the emotional side of that shift. Physically (and I’m not talking about your injury here), we go through a hard time and recuperate within a week or two. Emotionally can take months to digest that change, and in reality, years later, you will look back at this time and realise it is a continuing process because of just how much you have changed. That’s where that word comes in, you know that thing we want ‘right bloody now’. Patience is when you no longer ‘need’ to do anything. Just accept. The only hiccup on your radar now is, in getting comfortable with being alone and enjoy that solitude, but getting to a point that it feels too hard to get into a relationship. The hardships of integrating another person into your life, emotionally or physically. A lot of people, and I’ve done this, prefer to live apart so that they can interact to their hearts desire but need that place to go to so that they have somewhere for a time out. If that suits everyone then that’s fine. As long as it is for those reasons and not a fear of being ‘involved’ in life again. There is definitely nothing wrong with wishing for a George Clooney twin my friend, you will attract exactly what your heart desires. But I found it was when I was ok within myself and let that go, that they would suddenly bob up when I least expected it. (I think it’s that bloody patience word again 🙂 ). Thank you Mark. I think it’s going to be okay. I have known you for years and, though we have not met, I can tell you that you have grown in life. I think you’re pretty great too my friend. I hope that you’re doing well these days. The days move on and I move with them. Things are what they are and I am more able to see than now and enjoy those precious moments. A good friend of mine says it is what it is, and I have to say I agree. All we can do is move forward and live the best life we can. Meditation doesn’t work for me. For some unknown reason I am not built for it.